This section provides a tutorial example of how to view computers in the home network connected to the DSL modem through Ethernet cable connection or wireless connection. As mentioned in the previous section, the gateway modem controls two networks: the PPP network and the home network. We have reviewed the PPP network settings. Now let's review the home network settings. The home network connects my friend's desktop computer to the modem through the Ethernet cable connection. The home network also connects my laptop computer to the modem through the wireless connection. So we should see 2 computers on the home network. 1. Open a Web browser and enter this address: http://192.168.2.1/. The configuration main page shows up. CCF-001640CAC9B - This is my friend's desktop computer connected to the modem with the Ethernet cable. It is assigned with a local IP address of 192.168.2.11. HERONG - This is my laptop computer connected to the modem through the wireless connection. It is assigned with a local IP address of 192.168.2.12. 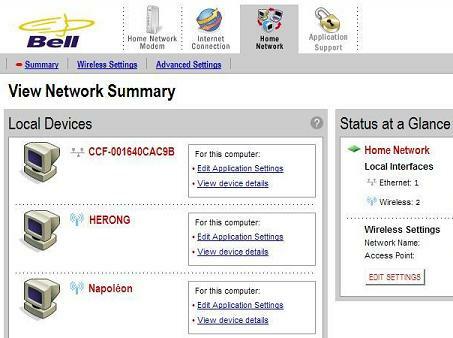 Napoleon - This must be a computer from someone in neighborhood connected to the modem through the wireless connection. It is assigned with a local IP address of 192.168.2.13. This is unexpected. We will enable the wireless security function to stop neighbors using the wireless connection. Web Server Log Files and Analysis Tool - "Analog"